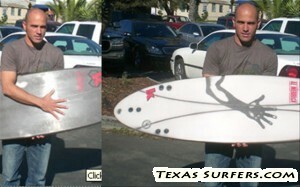 Check this thing out, it's a surfboard that runs on an engine. The problem is that while this guy looks relaxed, he doesn't seem to be having much fun. And surfing is all about having fun. But I do think it could have worked out for fishing on a pond. I wouldn’t brave waves standing up like that, though. An engine could be useful on a surfboard if the engine was very light-weight. It could help you speed up to catch a wave, assist with the paddle out, and you could give it a rev as you’re about to air. The extra air would be cool and the paddling easier, but we’d lose a lot of the exercise benefits we get from surfing. I never paid much attention to bamboo, but apparently it’s the strongest natural material on the planet. Bamboo surfboards are totally eco friendly, which is all good, but what about performance? GizMag.com says, “The lightweight boards also provide greater aerial potential and produce a ‘push-flex’ effect known in snow skiing [which delivers] higher control and speed in turns.” Check out Bamboo Surfboards here. Checkout this surfboard that actually changes color with heat. The board’s fiberglass has a pigment that’s sensitive to heat. As the board gets hotter, the fiberglass turns white, which deflects the sun’s rays. This keeps your board from getting too incredibly hot. Then, when you paddle out into the water and the board cools down, it returns to its normal, darker color.